Ready to move but not sure what to expect when hiring professional movers? Whether you’re moving between neighborhoods or across states, the process seems chaotic. Even after you hire professional movers, you may feel uneasy about the big day. We’re here to help. Moving doesn’t have to be a hassle. Hiring professional movers should take the stress out of your move, not add to it. Let’s dig into what you should expect when you hire a moving service. Before hiring professional movers you’ll need to know when you’re going to move. Most movers will ask for a 4-week to a 6-week window of time. To ease your process, and guarantee your safety while you move, come up with a plan. A great place to start is a checklist of the things you need to do to prepare yourself and your family. This will keep you on track for the weeks leading up to your move. Whether you are planning a local or long distance move, professional movers are here to provide you with a stress-free move that stays on your schedule. Your moving day will be here before you know it. After you make your checklist, you’re ready to start packing. Depending on whether you’ve hired a full-service moving company you may need to pack your items yourself. Pack your items in boxes beforehand. Tape these boxes closed. Leave them in the room in which you packed them. Label each box with the name of this room and a few key items. If you have hired full-service movers, they will handle this packing for you. You’ve made your list. You’ve followed it for weeks, anticipating the big day. Your moving service will let you know far in advance when they will arrive at your home. Make sure you leave room in front of your home for the moving truck to park. Failure to do so could result in an extra “long carry” fee. Once they show up, you should identify the operator of the truck. Often, he supervises the crew. Consider him your go to guy when you have questions. Your day should pan out something like the following steps. Your movers will conduct a short walk-through of your home to produce a written inventory of goods. They will assess the condition of every item in your home. Next, they will assign each item an inventory number. This list helps to ensure everything arrives at your new home in the condition it left your old home. It guards against false damage claims made on previous damage. You should agree with this assessment. Check that no item is missing from the list. Request a copy of the written inventory. Expect for the movers to determine the order in which to load the truck. Your moving service will determine in which room to start and how to best fit items into the truck. Set aside anything you don’t want to enter the truck such as flammables, personal items, breakable items or high-value pieces. Next, your movers will safeguard your home for the loading process. They’ll use blankets and padding to protect your carpet, stairways, hallways and floors. They’ll mark any hidden stairs within your home. Your moving team will also safeguard the outside of your home. They’ll mark off any hidden steps or broken sidewalks. Your moving company will come prepared with all necessary tools like carrying straps, carpet protectors, shrinkwrap, and rope. Movers will disassemble each piece like dresser mirrors and beds. They’ll wrap every item in padding. Your moving company loads the truck from floor to roof. This will resemble a puzzle, so don’t worry if you catch a glimpse of your things stacked on top of each other. To prevent your items from shifting, movers will arrange pieces for the tightest possible fit within the truck. Sometimes this involves taking items from other rooms and placing them together. You will tell your movers exactly where you want your items placed in your new home. You will tell your movers exactly where you want your items placed in your new home. If you let your movers know ahead of the time they can usually arrange to take your old or unwanted items off your hands. 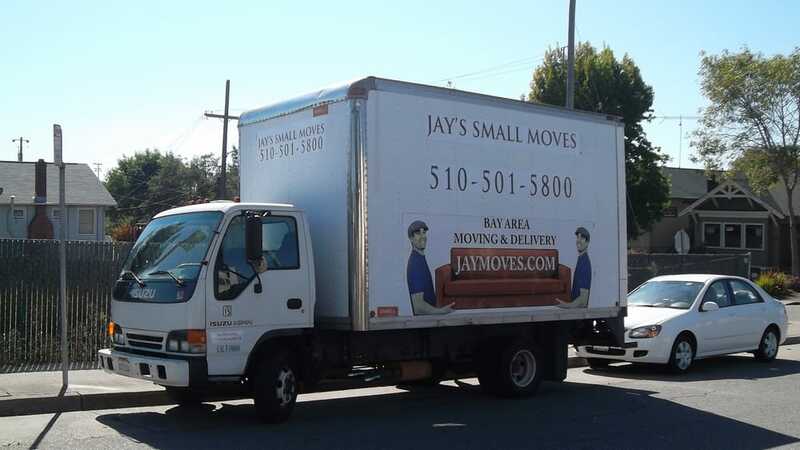 Professional movers may donate these items to local bay area charities or dispose of them. Once packed tightly, your items are ready to move to your new home. Remember that driver we spoke about in the beginning? He’ll present you with a bill that lays out all of the conditions of your move. This includes your estimate and expected date of delivery. You will need to sign off on this bill. Your movers are responsible for removing all tools, padding, boxes and anything else they brought into your home. No garbage should be left behind. Make sure you have a contact number for your movers and that they have clear directions to your new home. Consider having two people at your new place. One will oversee the inventory checklist, marking off and inspecting all delivered items. The other can assist your movers by letting them know where things go in your new home. If you find an item damaged during your move after the fact, it’s okay. You can always file a complaint with your movers after they leave. You’re Ready To Hire A Professional Moving Service! The excitement of moving to a new home should outweigh the emotional or physical stress. Knowing what to expect with professional movers eases stress. The more prepared you are beforehand, the faster and smoother the process of moving.